The Space Wolf kits give you no shortage of bits to make fun Wolf Guard. However, I did borrow some standard marine parts for this model; a combi-plasma and a pointing power fist. On somewhat of a whim I painted only one pupil in his eyes and it turned out to work really nicely and has become a feature. I know this isn't 40K related, but it's hobby related, so I've decided it counts and I can post it! 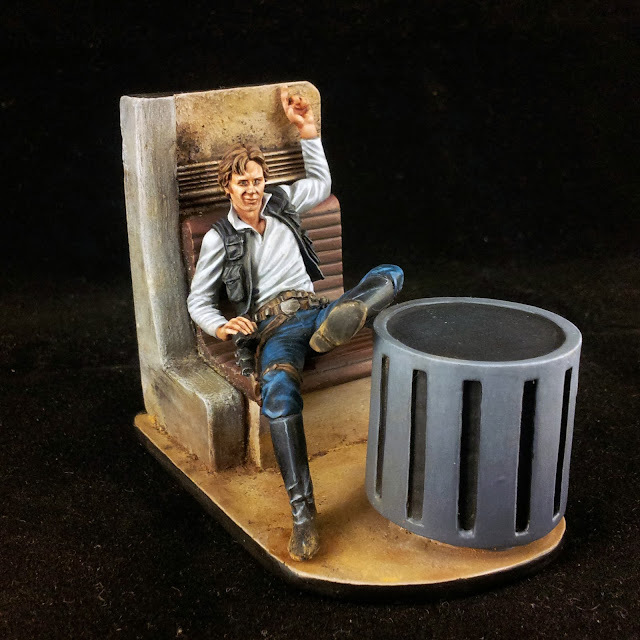 I picked this Han Solo model up a few years ago from Knight Models and only just recently painted it. I;m not sure why I left it so long, but I'm glad I did as I don't think I had the skills to do a half-decent job a few years ago. It is, of course, obligatory for at least one Terminator in your army to be equipped with a thunder hammer and storm shield. It's probably in the codex or something. So this is my big smashy-blocky dude; Halvr One-Eye. So, if you're wondering who this guy is and why he's known as 'One-Eye' (clue: he has one eye), read on! This guy is undoubtedly one of my favourite Space Wolf models. It was one of those models that just goes together great and I'm really pleased with the result. Good fun to paint too: a model you really like is always more fun to paint. There's a WIP post about this guy here, although his name has changed a little bit now. So, read on for more about Ranulf. I was nervous when I was preparing to add blood and gore to Angron and his victims. If I messed it up, then it would be very difficult to remove. But once again, the materials used did most of the work.